There's no doubt in my mind that without the love of my parents, support of great counselors, and access to the anti-depressant drug called Zoloft, I would be dead now. 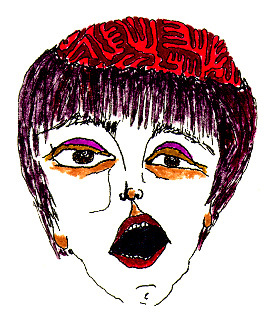 I drew this self-portrait in the initial stages of my bout with panic disorder and depression back in 1988. I know I can't expect to feel happy and wonderful all of the time, but mine were not ordinary ups and downs. At that time I was always physically exhausted. I had little or no appetite for food or for life for that matter. Nameless despair, fear, and hopelessness overwhelmed me. I cried all the time. Well-meaning friends and distant relatives told me to smile, to cheer up. That just made me feel worse. My parents knew better; they got me the medical attention I so desperately needed. I don't know if my problems with depression are tied to the fact that I'm a creative person, but research suggests that creativity and mental illness  especially manic depression  are closely linked. The good news is that, according to the National Institute of Mental Health, "of the mental disorders, depressive illnesses are very responsive to treatment." In my case, I went to my doctor and the psychologist my parents chose for me just to pacify them. I knew in my heart that I was a lost cause, that all the special treatment was a waste of their money. I felt terribly guilty about that especially. I couldn't remember a time when I didn't feel miserable. It was just my personality. The doctors told me that some people have to stay on anti-depressant medications their entire lives and others can take a short course of the drugs and then be done with them. It appears that I am among the first category. I've tried to taper off my medication and I've tried to stop taking it altogether, but each time I was right back where I started  in the hole. I tell you this not to discourage you, but so you'll know that it really is possible to feel better  with help. There is seldom a quick fix, but, the good news is, there are ways to cope.